This is Pen, a highly scalable, highly available, robust load balancer for tcp and udp based protocols such as dns, http or smtp. It allows several servers to appear as one to the outside and automatically detects servers that are down and distributes clients among the available servers. This gives high availability and scalable performance. Pen works on Linux, FreeBSD, OpenBSD, NetBSD, Solaris and most other Posix-like systems. It can also be installed as a service on Windows. Pen supports GeoIP filtering and can be configured for SSL termination, direct server return and transparent reverse proxy. 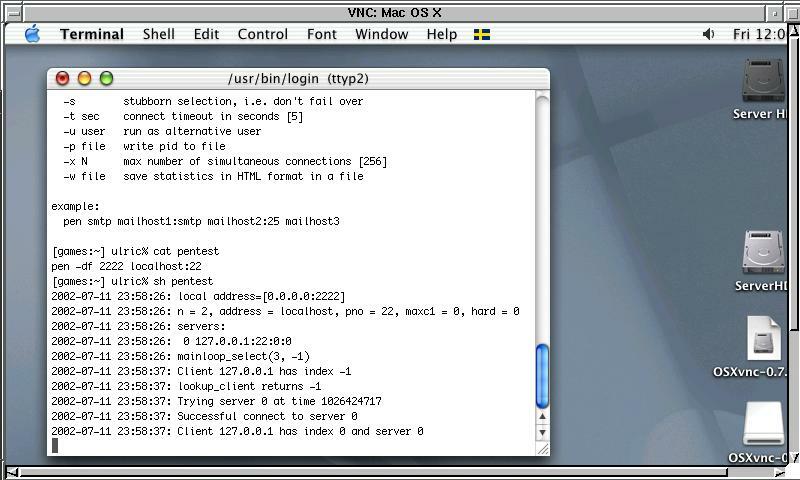 Pen is of course compatible with IPv4 and IPv6 as well as local sockets on systems that have them. The load balancing algorithm keeps track of clients and will try to send them back to the server they visited the last time. The client table has a number of slots (default 2048, settable through command-line arguments). When the table is full, the least recently used one will be thrown out to make room for the new one. This is superior to a simple round-robin algorithm, which sends a client that connects repeatedly to different servers. Doing so breaks applications that maintain state between connections in the server, including most modern web applications. When pen detects that a server is unavailable, it scans for another starting with the server after the most recently used one. That way we get load balancing and "fair" failover for free. Correctly configured, pen can ensure that a server farm is always available, even when individual servers are brought down for maintenance or reconfiguration. The final single point of failure, pen itself, can be eliminated by running pen on several servers, using vrrp to decide which is active. client table, not the connections table as expected. See issue #38. 170217  Corrected typo in pen.c per suggestion by Belinda Liu. A side-effect of the load-balancing is that several logfiles are produced, and all accesses seem to come from the load balancer. 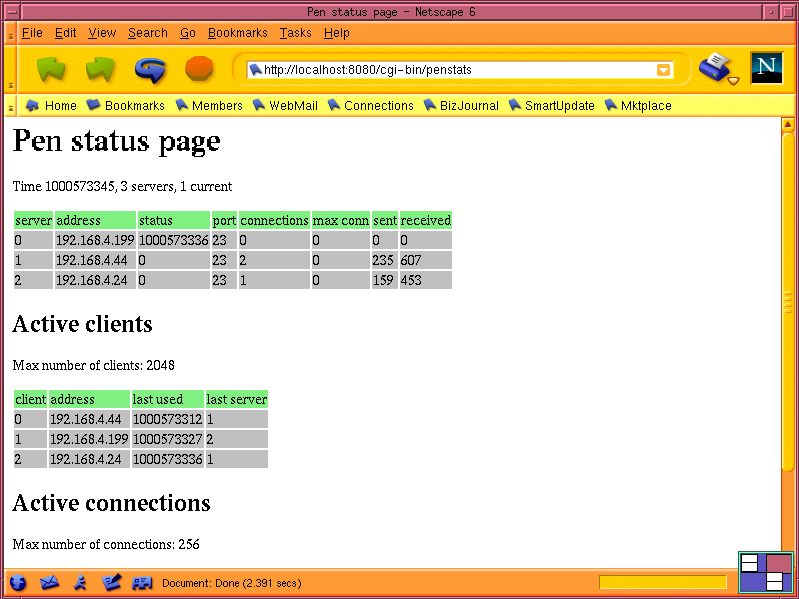 The program penlogd solves this problem by merging pen's log file with the ones produced by the web servers. See penlogd(1) and penlog(1) for details. Pen emits statistics when it receives a USR1 signal, but the output can be hard to interpret. The cgi script webstats can be used in conjunction with the -w option to pen to get statistics in HTML format instead. Note that there are usually few active connections. This is because of the way the web works: the client connects, the server sends data, the client disconnects. The whole transaction is over in seconds. This load balancer is known to work on a long lite of operating systems, including but not limited to FreeBSD, Linux, HP-UX, Windows and Solaris. Other Unixes should work as well, possibly requiring trivial changes. Success stories or problem reports are welcome. It runs on Windows, too. to install into /usr/bin instead. Zen load balancer, a load balancer appliance based on Pen.